¡Únase a nuestra Campaña Nacional de Oración! Prayer is the foundation of all we do in the pro-life movement, and we invite you to join tens of thousands of others who are offering, each day, a prayer of commitment to build a culture of life. We urge you to pray, throughout the year, the daily prayer to end abortion. We invite Christians of every denomination to join in saying this prayer each day, and to let us know that they are saying it. Throughout the year, Priests for Life will invite believers to participate in various prayer campaigns, connected with seasons of the Church year or events in our movement or our nation. See the current and upcoming prayer campaigns above. "A great prayer for life is urgently needed, a prayer which will rise up throughout the world. 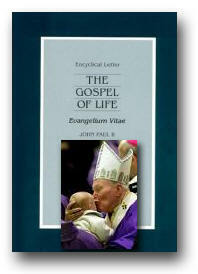 Through special initiatives and in daily prayer, may an impassioned plea rise to God, the Creator and lover of life, from every Christian community, from every group and association, from every family and from the heart of every believer.” – Pope John Paul II, The Gospel of Life (Evangelium Vitae), n. 100. For the healing of fathers of aborted children. That the unborn be remembered at graduation ceremonies nationwide. For an increase in pro-life themes in mass media and entertainment. For those who share their testimony of pain and healing after abortion.